IN THE MIDDLE 1800s, the Pah-Ute Indians in the southern portion of the Great Basin made frequent and sanguine forays against the white settlers, emigrants, military and miners in the area from Fort Mojave on the Colorado River, all the way into the San Bernardino Valley. As a result, a series of U.S. Army forts, camps, outposts and redoubts were built in the lonesome desert areas, each situated reasonably close to a supply of water. Here, at these small, isolated camps, the military waged a curious kind of warfare with the Indians. 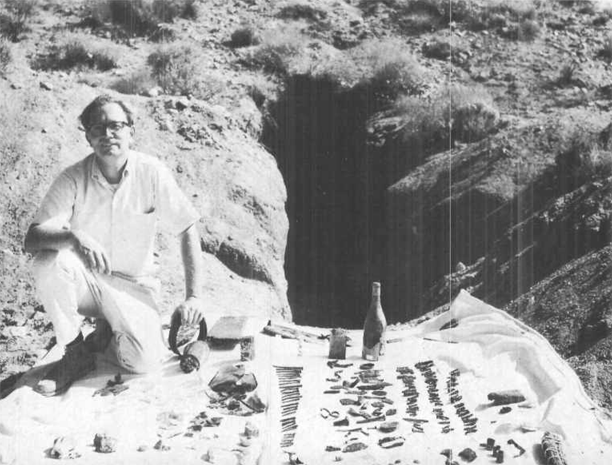 Dennis Casebier and artifacts found at the site of old Camp Rock Spring. Not too much has been written about these military outposts in the Mojave Desert, almost no work has ever been done in the national archives. Dennis Casebier changed all that. Casebier was a Marine stationed at the the Marine Corps base near Twentynine Palms in the period 1953-1956. Not a Californian. he was fascinated by the desert. In 1956 he returned to school in Kansas, came back to California a physicist working for the U.S. Navy and now stationed in the San Bernardino area, and with his new wife started exploring the desert. He decided early that he would concentrate on the Mojave Road. His work took him frequently to Washington, D.C. where, at night, he poured through the national archives seeking information about these tiny, remote military outposts that flourished in a period from 1860 to 1869. The research paid off. Today he is considered the doyen, the expert on this area and these outposts. He spends much time at the sites, knows the owners of the private land that some of the sites are situated upon, knows the desert people, and has made good and lasting friends. Dennis Casebier is 38. Thus far his research has resulted in the publication of four books on the general area. The first, Camo El Dorado, Arizona Territory, was published by the Arizona Historical Foundation. Three subsequent books are all on the outposts of the Mojave Road which Casebier published himself in limited editions. These are Carleton’s Pah-Ute Campaign, The Battle of Camp Cody, and finally, Camp Rock Springs. California. Projected are future books on Fort Pah- Ute, another Camp Cady volume, (there are many subjects for books about Camp Cady), and others of the outposts. 1. Lane Ranch, near the site of Oro Grande, a frequent stopover site but not a military outpost. 2. Forks of the Road. Where the Mojave and Old Salt Lake City Trails forked ,nine miles west of Camp Cady. 3. Old Camp Cady, established briefly in I860, active again in 1865-70, the most important military outpost in the Mojave Desert. 4. The Caves of Afton Canyon. A trading post was once located here. 5. Soda Springs, in I860 called Hancock’s Redoubt. !On west edge of Soda Lake near spot of present-day Zzyzx. 6. Marl Springs, 1876 to 1878. It was 35 miles between water to Marl Springs in those days, a long dry crossing. 7. Pah-Ute Spring, higher, c o o l e r , 5000 feet. Lots of free flowing water here. A fantastic archeological site that has been heavily vandalized. Active 1867-68. Once called Camp Beale in days of camel crossings. 8. Fort Mojave, with adjacent Hardyville. An Indian school stood here once. All buildings gone, only sidewalks and foundations remain, even graveyard heavily vandalized. And beyond Fort Mojave toward Prescott, Casebier has pounds of documentation about other forts, camps and outposts. To single out one specific desert history subject and to follow through on it to the end, is important for us all—students, and scholars and armchair adventurers. Dennis Casebier has done this in a job of incredible dedication and zeal, and at no little cost to himself. He deserves the highest kind of credit for this effort which will, for years to come, serve everyone here. I was introduced to the labors of Dennis G. Casebier by my old desert buddy, E. I. “Eddie” Edwards, lately of Joshua Tree and more recently of Sun City. Casebier, in a recent conversation, has told me that there are a number of interesting and significant military sites adjacent or approaching the Army posts that are on private land. Casebier has made good friends in the desert during the years he has researched the Mojave Road and has permission to examine the sites on private land. Sometime in the late summer or fall of this year he has scheduled a metal locator search on these private land areas. Casebier told me that if he finds significant articles he will notify concerned museum people and will give me a report to share here with you. He is a vigorous campaigner for protection of all the old military sites. He would like to see them guarded against vandalism and unauthorized digging and activities that would hamper later, serious archeological work. The U.S. Army outposts along the old Mojave Road are now being protected, as far as written history is concerned, by Dennis Casebier. He, and I, would like to see these ancient, remote, poignant outposts in the hostile Mojave preserved as state parks or a string of National Monuments, or something equally secure, so that visitors here in those years in the far future can understand the march of living history that once was enacted so violently here during the various Pah-Ute campaigns across the lonesome California desert.